This time of year my soul feels as if it’s sipping a mug of delicious hot apple cider – there is so much heart-warming thankfulness floating in the air from everyone around me. For all our readers around the world, this Thursday is Thanksgiving in the United States, so we’re neck high in turkeys, Pilgrims, and, most wonderfully, lots of giving of thanks. It’s one of my favorite American holidays as I always find joy in the communal act of pausing to give thanks for the simple things, past and present. This year I’ve tried something new with the children. We directed our thankfulness thoughts to the future as well. Nah, we don’t have a crystal ball. I wasn’t suggesting that the kids be thankful for an unknown future – though there’s value being thankful for the promise of tomorrow, a brighter future ahead. Instead, I shared with them something I’d been reflecting on lately. That thankfulness is of two kinds – words and deeds. There is giving thanks through one’s words by saying “Thank You” and the like. And then there is showing gratitude through one’s actions. This became the theme of an activity we did in our virtues-focused children’s class yesterday. After listing many things each person was thankful for, we contemplated the idea of wordless thanksgiving. Each child was challenged to think of one thing, person, etc. they are thankful for and then think of a way to show gratitude with their actions. One of my sons’ eyes lit up instantly. He started gathering everyone’s dishes to remove from the table. Just moments before, he’d listed “snack!” as what he was thankful for. He’d been particularly ravenous and gobbled up his snack quickly during storytime. And our discussion was apparently getting him to think of thankfulness in a new way: he could show his appreciation for snack by helping with the cleanup. I’m thinking we’ll revisit this concept many times. How can you show thankfulness for all the clean laundry tumbling out of the dryer? How about for the toys you’ve been playing with? I’m getting giddy imagining piles of folded laundry and toys happily in their homes. We went on to create beautiful Gratitude Leaves to hang from Thankfulness Trees. Many blogs provide inspiration for these leaves and trees, and the idea was even mentioned in our recent post about Hurricane Sandy’s opportunity to do some soul growin’ with the kids. Playful Learning’s post is one I especially love. In short, it’s a colorful fall leaf on which, once pressed, you can write a thought of thankfulness and then display hanging from a twig “tree.” You can also coat the leaves with modge podge to help preserve them. If you have preschoolers and want to create more durable leaves so they don’t crumble while writing on them or you want to make a fun game of it, All Done Monkey has great ideas here that are sure to delight little ones. 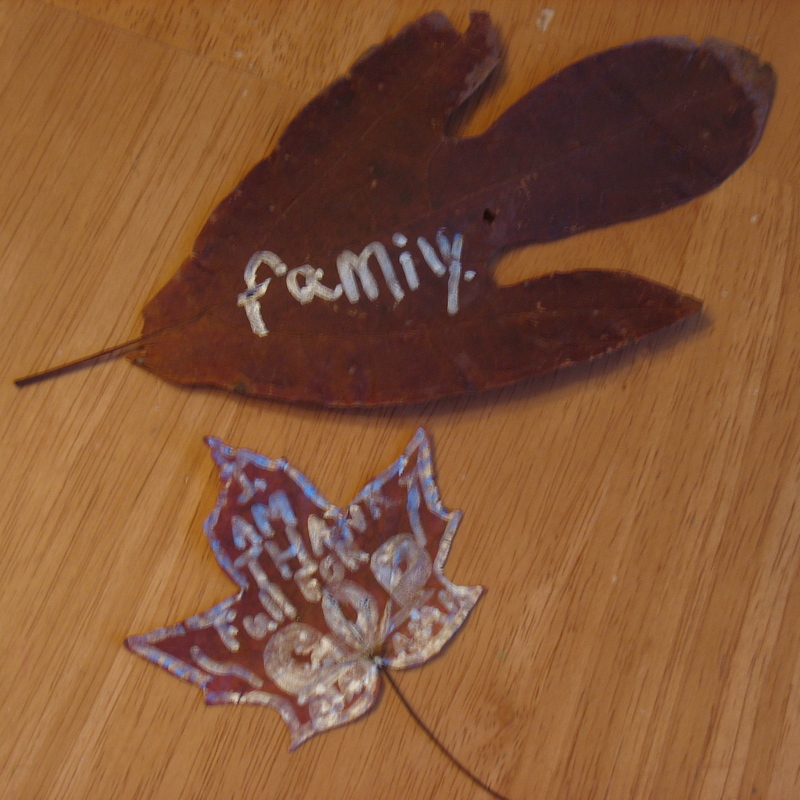 My idea was to have the children write one word or a brief phrase on the backside of the leaf describing an action they could take to express their gratitude. But the ink was still drying on the leaves when it was time to wrap up. Since our time was limited this week, we encouraged each family to go on a nature walk in search of a multi-pronged branch to place in a weighted vase or pot and serve as a Thankfulness Tree. We suggested the kids collect more autumn leaves to press and keep in a basket by the tree on which to write more ideas as thankfulness thoughts come to mind. 1) Words – Strive to feel the gratitude in your heart when you voice your thanks to someone. Make sure the soul is truly speaking. 2) Deeds – Try to express your gratitude with an act of service of some sort. When a direct action related to your thought of thankfulness is not easily attainable or obvious, you can always start with a smile and a prayer in your heart to be directed to act in a way that shows your gratitude. I’m excited to mirror our bountiful dinner this week with extended family with a trip to our local Food Bank to deliver lots of goodies. Even more, I’m looking forward to seeing how this mindful approach to thankfulness plays out with our three boys. Hopefully all our souls will feel a sweetness like that of sipping hot cider together as our days fill up with more and more intentional acts of kindness. Random ones welcome too! Oh, and real cider sipping definitely in the plan! While our thoughts are on thankfulness, please stop by our first Thankful Thursday Giveaway. Simply leave a comment by 11/22 – something you’re thankful for – and you’ll be entered for a chance to win one of Renee & Jeremy’s magical cd’s + a Love All the World bodysuit or tee from Tender Sapling. There’s also a link to download a free Renee & Jeremy song. Just our small way to thank you! Here’s wishing you all a very happy week filled with gratitude! Categories: Have Fun, Virtues | Tags: Actions, Deeds, Giveaway, gratitude, Leaf Craft, Renee & Jeremy, Tender Sapling, Thankfulness, Thankfulness Tree, Thanksgiving, Words | Permalink. Great post on thankfulness, Emily! Thank you! We just started a neighborhood children’s class for all the kids on our street and we’ll be focusing on teaching spiritual qualities like generosity, love, kindness, etc. The first one we picked to work on is thankfulness, and I love the idea of talking about showing thankfulness in both words and deeds. You’ve just given me a great idea to have the kids think of how they can show thankfulness through their deeds. Love it! Hi Laura! Good luck with the virtues-based classes. Sounds like fun! I’m sending you a beautiful song on Thankfulness from Enable Me to Grow to learn with the kids. Thanks for your blog, I’m really enjoying it! Hi Chelsea! I too love all the collective focus on thankfulness and directing one’s actions toward others. Love your Thankfulness quotation song so much! Thank you for sharing and best wishes with the final recording of it. Love your blog too! Thank you!